SUNSEEKERS and city-break enthusiasts from Northern Ireland will be among the first in the UK to take trips aboard the earliest deliveries of a £2.5 billion fleet of new generation aircraft bought by Jet2 and Jet2holidays. 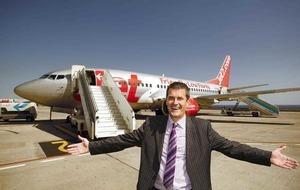 The travel company – which has enjoyed stellar growth over the last five years – has signed on the dotted line to purchase 30 new Boeing Next Generation 737-800 aircraft, each worth in the region of £75 million. 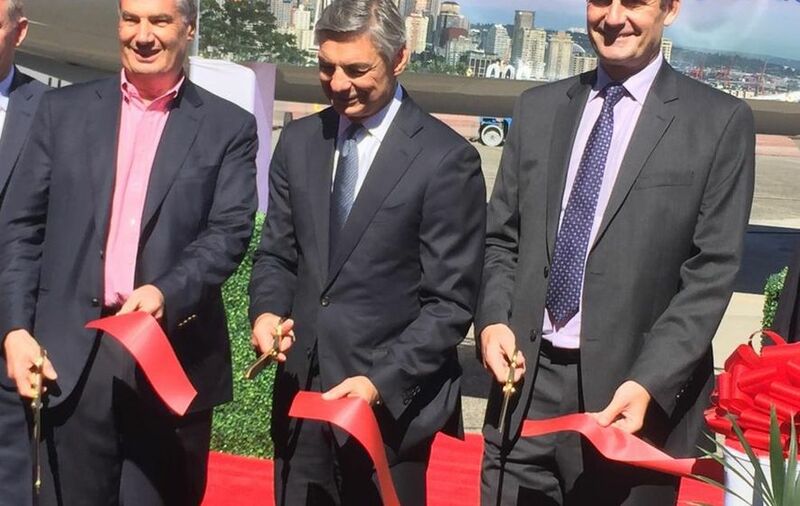 Company hierarchy have been in Seattle this week to see the first plane take to the skies in a symbolic ceremony at Boeing’s behemoth headquarters in the US west-coast city. Another eight 189-seater 737s will be added to the fleet by Christmas, with travellers from Belfast International likely to enjoy the comfort of pristine new planes on some of the 17 routes operated by Jet2. Belfast is one of Jet2’s nine UK bases, and last year shifted 345,000 passengers on package holidays and flight-only trips to sunshine, ski and city destinations. 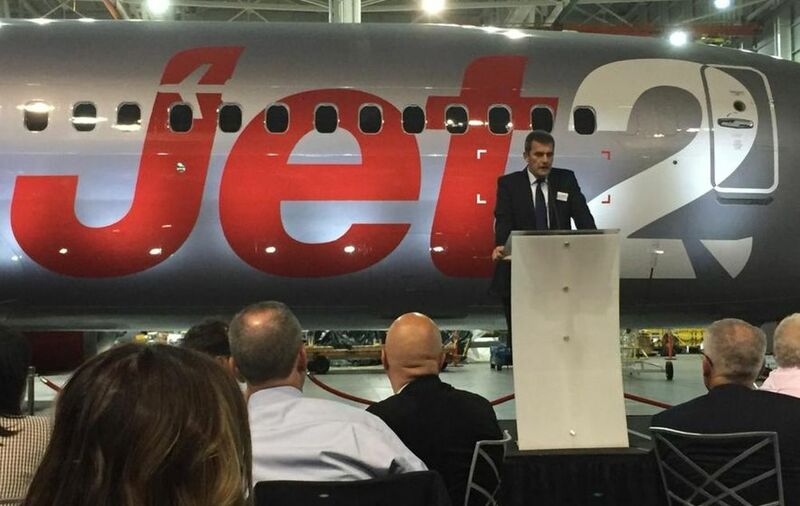 “We’ve been in Belfast more than 10 years, and customers there will love the comfort and efficiency of these beautiful planes,” said Steve Heapy, chief executive at Jet2.com and Jet2holidays. The company is owned by Leeds-based Dart Group Plc (which in the year to March saw revenues leap 15 per cent to over £1.4 billion as it more than doubled its operating profits from £50.2m to £105m) and employs 114 permanent staff at Aldergrove. Some 38 flights a week departed Belfast during the peak summer season just ended, and last year Jet2 carried 280,000 flight-only passengers and 65,000 holiday customers from the north. A relatively new player in the aviation sector, Jet2 had a modest annual capacity of 14,000 when it launched flights from Belfast in 2004, but since then 1.7 million passengers have flown with the airline. Its 16 existing destinations from Belfast include popular sun routes to Alicante, Faro and Majorca, but it also operates to the likes of Dubrovnik, Ibiza, Gran Canaria and Reus in Spain. For 2017 it will add Girona (Costa Brava) to its schedule, and Heapy says Belfast can expect to see a further expansion to its route map. The first of the new Jet2 aircraft was formally handed over at a special ceremony at Boeing’s Seattle Delivery Center in the United States. The aircraft 30 have an approximate list price of $2.9 billion, and although Jet2 wouldn’t confirm precisely what it paid, it revealed it had “negotiated significant discounts from this price”. The new aircraft will support the ongoing growth of the company, which has launched its biggest-ever flights and holiday programme for 2017 and last month announced almost 1,000 roles in pilot, cabin crew and engineering positions in support of this growth (at least 50 of whom will be based in Northern Ireland). Heapy added: “This is a milestone moment in our history and demonstrates how committed we are to investing in growing our business and providing unrivalled economics, exceptional reliability and outstanding passenger comfort. 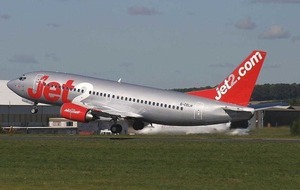 The 737-800 delivery is the latest stage in the growth story of Jet2.com and Jet2holidays, which took to the skies from Leeds-Bradford airport in 2003. Since then, the company has expanded to become the fourth largest registered airline in the UK, flying more than six million passengers last financial year and providing low fares to 65 sun, city and ski destinations. The Boeing 737-800 is part of the successful Next-Generation 737 family. It is known for its comfort, reliability, fuel efficiency and advanced engine and wing technology. The aircraft can fly approximately 3,000 nautical miles (5,500 km), up to 900 nautical miles more than earlier 737 models, and 175 nautical miles (320 kilometres) further than competing aircraft. It also consumes five per cent less fuel while carrying more passengers than competing aircraft. The new Boeing 737-800 aircraft makes its maiden flight to the UK on Thursday, landing at Leeds Bradford Airport where special finishing touches will be made before its inaugural flight.